Blog - Visionary Eye Doctors n a Pterygium | Carnosdidad Grow Back After Removal? When trying on glasses, do you struggle to know which glasses may work best on you? We have some tips which may help and once you know which shape your face most closely resembles, then you can start narrowing down glasses to make your decisions easier. Oval: Frames that suit an oval face have a strong bridge, are wider than the broadest part of the face and are geometric in shape. Frames to Avoid: Eyeglasses that are overlarge and cover up more than half of your face will throw off the natural balance and symmetry of the oval face. Heart shaped, Base-up triangle: Frames that balance the width of the forehead with the narrowness of the chin are ideal. Eyeglasses with low-set temples and bottom heavy frame lines will add width to that narrower part of your face. Round eyeglasses or square eyeglasses with curved edges will help draw attention away from a broad, high forehead. Frames to Avoid: Steer clear of any style or color of frames that draws attention to the forehead. This includes frames with decorative temples or embellished tops. Oblong: frames with more depth than width. Frames to Avoid: Narrow and rectangular shapes will make your face appear longer, so steer clear. Square: Eyeglasses that soften the angularity and sit high on the bridge of the nose look best on square faces. Oval or round eyeglasses will balance and add a thinner appearance to the angles of a square face. Frames to Avoid: Angular and boxy eyeglass frames will sharpen and draw attention to your angular features, making a square face appear bulky. Diamond: Play up a narrow forehead and chin with eyeglass frames what sweep up or are wider than the cheekbones, such as cat eye glasses and oval frames. These frames will accentuate your cheekbones and delicate features. Frames to Avoid: Boxy and narrow frames will accentuate the width of your cheeks, drawing attention to your narrow features rather than enhancing them. Round: Eyeglass frames that are square or rectangular tend to be wider than a round face. This quality can enhance your face by making it appear slimmer and longer, adding balance to your round features. Frames to Avoid: Rimless frames, round frames and small frames will accentuate the roundness, making your round face look even rounder. Some features to consider highlighting would be your eyes, hair, skin color, and face shape. For example, if you have blue eyes, try a blue or blue gray frame to match and highlight your eye color. Warm coloring: Stay away from contrasting colors such as pastels. White and black frames may tend not to be flattering either. Instead, the best frame colors for you are light tortoise, browns shades, gold or honey, copper, red, beige, warm blue and olive green. Cool coloring: Avoid colors that wash you out and instead reach for frames that are silver, black, dark tortoise, pink, purple, blue, rose-brown, mauve and gray. Blue Protect blocks harmful computer, smartphone, tablet and etc rays from harming your eyes, releives eye strain and helps in visio clarity. DriveSafe Lens provides better vision in low-light conditions for safer and more comfortable driving, reduces glare at night from oncoming cars or street lights, provides up to 43% larger mid-distance zone for easier focus switching between dashboard and mirrors. Our opticians can help you in selecting the perfect pair and with our WOW gurantee – it’s great to shop local and small! January is National Glaucoma Awareness Month and the perfect time to spread information and awareness about this sight-stealing disease. More than 3 million people in the United States suffer from glaucoma and that number will continue to increase significantly. This symptomless disease is not preventable and as much as 40% of vision can be lost without a person noticing. Early detection. Our comprehensive eye exams will include tests for glaucoma, including a simple and painless procedure that measures the internal pressure of your eye. During the exam, your doctor will also examine the health of the optic nerve and measure your field of vision. Our glaucoma specialist, Thandeka Myeni, MD, MPH is board- certified, fellowship-trained in both glaucoma and cataract and refractive surgery and utilizes the latest in diagnosis, treatment and surgical options. The earlier glaucoma is detected, the easier it is to treat! With a diagnosis of glaucoma, it’s best to follow up with an ophthalmologist who specializes in glaucoma at regular intervals to determine the best course of treatment and ensure that your treatments are working effectively. All glaucoma treatments are aimed at protecting the patient from further, irreversible vision loss. Daily eye drops that help reduce the pressure in your eye are typically the first line of treatment followed by laser treatments and incisional surgical procedures. While there is no cure for glaucoma, these treatments can slow its progression and prevent further vision loss to reduce the likelihood of significant visual disability resulting from the disease over a patient’s lifetime. If you are due for a glaucoma screening, make a resolution to reach out and schedule an appointment with Dr. Thandeka Myeni, MD, MPH at 301-896-0890 or request to schedule online. https://www.voeyedr.com/wp-content/uploads/2018/03/visionary-eye-doctors-logo-lg.png 0 0 Kim Neal https://www.voeyedr.com/wp-content/uploads/2018/03/visionary-eye-doctors-logo-lg.png Kim Neal2018-11-12 16:01:282019-04-18 14:02:04Can a Pterygium | Carnosidad Grow Back After Removal? How not to let your Halloween Contact Lenses turn your eyes into a permanent fright! Its time to start thinking about enhancing your Halloween costume and prescription costume contact lenses are the perfect finishing touch to any spectacular costume! If you are considering using costume contact lenses as part of your Halloween get-up this season, make sure you don’t purchase them from a gas station, online store, nail salon or other unlicensed dealer—or you and your eyes could be in for a real scare. We’ve seen many cases during past Halloween seasons, where people who wore illegal costume OTC lenses ended up with an eye injury or inflammation. One of the more serious risks people face when wearing costume OTC lenses is developing a corneal ulcer. This happens when a bacterial infection occurs under the lens and can cause pain, irritation, discomfort and possible blindness. This occurs when the lenses injure or scratch the eyes. If they are not tailored to a person’s eyes, the lenses may scratch or cause an infection, particularly if they are not kept clean with the correct solution or by not fitting properly and/or people don’t receive or follow proper instructions on how to insert, remove and sterilize lenses. Adolescents and young adults are the most common groups affected by the risks associated with some decorative contact lenses, according to the FDA. Moreover, the Centers for Disease Control (CDC) states that when decorative contact lenses are sold without a prescription and without proper fitting and education about wear and care from an eye-care professional, the potential for permanent eye damage–including blindness increases. Cosmetic contact lenses are easy to find and are often sold illegally without a prescription online, novelty shops, barber shops, beauty salons, mall kiosks, Halloween costume stores, convenience stores and even gas stations. Because contacts are a medical device that is regulated by the FDA, it is illegal to sell contacts without a prescription and any supplier who doesn’t require a prescription is breaking the law. Your doctor will be sure that the decorative lenses that are prescribed for you are FDA approved for use on the eye and that the lenses fit your eyes appropriately. Once you have the prescription for your decorative lenses and you’ve bought them, we will be sure to show you to how to properly insert and care for safe wearing. Call us about our costume lenses and be sure to order by October 18th to be in time for Halloween! https://www.voeyedr.com/wp-content/uploads/2018/03/visionary-eye-doctors-logo-lg.png 0 0 Kim Neal https://www.voeyedr.com/wp-content/uploads/2018/03/visionary-eye-doctors-logo-lg.png Kim Neal2018-09-24 20:23:502019-04-18 14:00:40How not to let your Halloween Contact Lenses turn your eyes into a permanent fright! A very successful surgical mission was carried out by Visionary Foundation and Alberto Martinez, MD from August 23 to August 28, 2018 at “Fundación de Servicios Medicos Voluntarios” (FSMV) Hospital Leonardo Martinez, San Pedro Sula, Honduras. FSMV, a charity clinic led by Marcos Fajardo, MD, serves the impoverished population of San Pedro Sula. Dr. Fajardo provided the logistic support and infrastructure that allowed us to provide free surgical eye care. The patients who received surgery were pre-screened by Dr. Fajardo. Pre-surgical screening consisted of a complete eye exam, diagnosis and plan. Once the need for surgery was determined, appropriate testing such as axial eye length measurement, corneal topography and B-Scan ultra-sonography were performed. This year, Dr. Martinez spent time training local ophthalmologist Edgar Maldonado following the principle of “When you give a fish to a man, you feed him for a day. When you teach him how to fish, you feed him for a lifetime”. The principal focus of training was clinical cornea, cataract and corneal transplant surgeries. Patients were seen on their first postoperative day. Cornea patients were seen again three days later, at the end of the surgical mission. All medications needed for postoperative care were provided for free. Postoperative care of these transplants will continue via telemedicine with the by using the app WhatsApp, by means of high quality photography and descriptions. We plan to return in August 2019, this time with 2 surgeons. One surgeon may focus exclusively on transplants the other on cataract surgery. Thus, we hope to have a larger surgical impact. One of the most difficult parts of the mission was the heart wrenching process of turning down many people who direly needed a corneal transplant because we did not have enough cornea tissue. In addition to the surgical mission, Anna Pigotti with the support of Visionary Foundation provided funds to help maintain the infrastructure of the facility where 80+ girls of all ages reside at the orphanage “Hogar San Jose” directed by Sister Thelma. Future plans in this area include visiting the orphanage in October 2019 and providing cash donations to cover a few of the many basic needs. Once again, thank you for your generous help. You have literally shone light into the life of our fellow human beings. May your contribution become a light of kindness filling your heart with joy! Even the most gifted students will struggle academically if they have trouble seeing the blackboard or focusing on a book. It is estimated that over 60% of children with learning difficulties have an undetected vision problem. 80% of information kids receive in the classroom is presented visually and vision can affect sports performance, too – hand-eye coordination, depth perception and eye tracking ability. Healthy eyes and good vision are essential for your kid’s growth and development. Often, vision issues are at the root of learning problems and behavioral issues and may unfortunately go unchecked and misdiagnosed. If your child is having trouble in school, you may want to start out with a comprehensive eye exam and see if there is a vision issue first with your child before pursuing other avenues. Often, parents and teachers think that a school vision screening is good enough to assess your child’s vision, so if that test comes back okay, they believe there is no vision problem. However,this may be far from the case. A school vision test usually only assesses visual acuity for distance vision or how far a child can see. Even a child with 20/20 vision can have significant vision problems that prevent them from seeing, reading and processing visual information. We recommend all kids of school age have yearly comprehensive eye and vision exams to ensure any issues are addressed and taken care of as soon as possible. It’s also important to have an exam prior to entering kindergarten, as undetected lazy eye may be more complicated to treat past seven years of age. Some of the issues our optometrist may look for, in addition to good visual acuity, are the ability to focus, eye teaming and tracking, visual perception, hand-eye coordination, depth perception and peripheral vision. They will also assess the health of the eye and look for any underlying conditions that may be impairing vision. Depending on the problem the eye doctor may prescribe eyeglasses, contact lenses or vision therapy to correct the issue. Add a comprehensive eye exam to your back to school to-do list. Our experienced, kid-friendly optometrists look forward to making sure your child has the best possible chances for success in school. And we know, kids will be kids. Our WOW Guarantee worry free protection plan was made with that in mind. Check out our Back to School Specials! 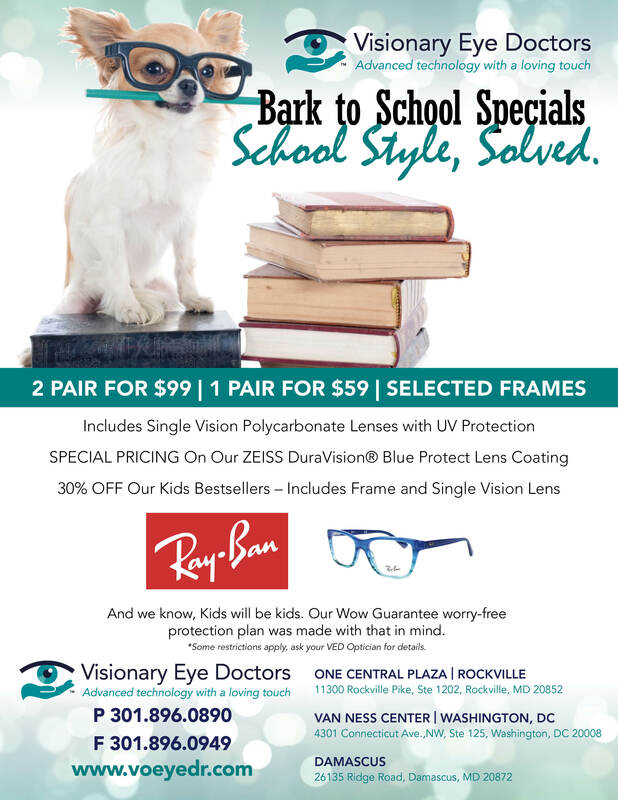 Schedule your child’s eye exam today, 301.896.0908 or request to schedule online! LASIK allows you to experience life as you may have never known it: clear and hassle-free. You may pursue life with new confidence, enthusiasm and ease thanks to LASIK. The procedure takes just a few minutes, but its results can have a tremendous impact on a patient’s quality of life. The first step is to determine if you are a good candidate for vision correction surgery. Our Refractive surgeon, Dr. Alberto Martinez will perform a thorough diagnostic eye exam to determine your if LASIK Surgery is a good fit for you. If you are not a good candidate for LASIK, no worries there are LASIK Alternatives, including PRK, ICLs, Clear Lens Exchange, click here for more info. We cannot promise that you will never need contacts or glasses again – beware of anyone who makes such a promise – but LASIK can drastically decrease your dependence on these visual aids. Choosing a skilled and experienced LASIK eye surgeon can help reduce these risks and enable you to achieve the best possible results from laser eye surgery. To schedule a consultation with Dr. Alberto Martinez and discuss if LASIK is right for you, contact Visionary Eye Doctors at 301-896-0890. We are excited to welcome Dan Sarezky, MD! 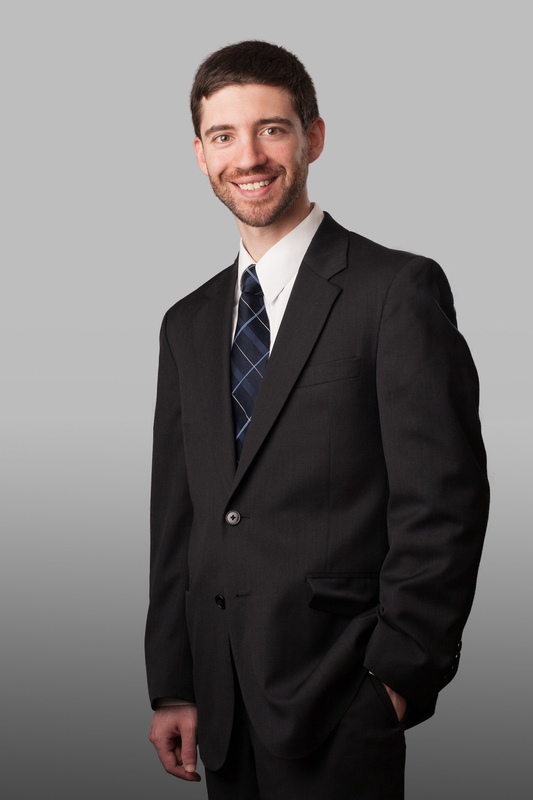 Book an appointment with Dr. Sarezky in our Rockville or DC office. Even Non-Surfers Can Get Surfer’s Eye! If you spend a lot of time working or playing outdoors, you run the risk of developing a pterygium/carnosidad, commonly referred to as Surfer’s Eye. Despite the name you do not need to be anywhere near the ocean to acquire surfer’s eye; you just need excessive exposure to UV radiation or dry, dusty environments. Pterygiums/Carnosidads are most common in people between the ages of 20 and 50 years and are more common in men. Also, Pterygia (plural for Pterygium) often occur in multiple members of families thereby indicating a genetic predisposition. People who live or are from tropical climates, occupations such as, landscapers and other outdoor workers, people who participate in sports such as soccer, sailors, surfers, golfers and skiers who are subjected to a lot of reflected UV light and populations living where there is ozone layer depletion, have a higher incidence. People who tend to suffer from dry eyes may also be more prone to developing a pterygium particularly if they spend a great deal of their time outdoors. The Good news is that if you have been diagnosed with a pterygium/carnosidad, you have access to one of the leading pterygium surgeons in the world, right here at Visionary Eye Doctors that can help treat your pterygium and has one of the lowest recurrence rates in the world, less than 1%. Dr. J. Alberto Martinez has a true passion for patients affected by Pterygium, and he is completely empathetic in your journey – as he too has a personal story with Pterygium that you may read here. Your eyes are often the first thing that people notice about you. We can help! For more information, please go to www.eyewhitemd.com and request a free pterygium/carnosidad screening! Schedule your kids (and yours too) Back to School Comprehensive Eye Exam Today – We Hope to See the Entire Family! Refractive Lens Exchange (RLE) is gaining popularity as a surgical option for people who are over age 45 and beyond who want to decrease or eliminate their dependence on glasses or contacts. As we age, we all expect different parts of their body to become slightly less functional with wear and tear over time. People can be in excellent physical condition into their 80s and 90s. It doesn’t require world-record athletic ability to be able to function perfectly in our daily lives and seniors are more active today than ever. When you are young, the natural lens acts like the zoom function in a camera, allowing you to focus up close, without the need for reading glasses or bifocals. However, the lens inside the human eye is designed to fail over time. It’s the only part of the body I can think of that inexorably gets worse to the point of non-functionality in a shorter timespan than it takes to grow very old. As you age, the lens progressively becomes dysfunctional resulting in loss of near vision (presbyopia) that requires the use of reading glasses or bifocals. With aging, the lens also progressively becomes hard, yellow and cloudy (cataract). Cataracts block and scatter light reducing visual quality, quantity and color perception. This progressive loss of function of the natural lens inside the eye is referred to as Dysfunctional Lens Syndrome. Everyone gets cataracts. Fix the Problem Before It Starts. Your lenses continually age throughout life. This results in the need for reading glasses or bifocals in your 40′s and eventually cataract surgery in your 70s or 80s. This is the reason that RLE prevents cataracts. Lens changes cause progressive deterioration in vision. More and more patients do not want to tolerate the years of progressive decline in their vision as they develop cataracts; they want it permanently fixed now and not be hindered by cataracts later in life. With the advancement in technology and the safety of the procedure, patients are now choosing to have their natural lenses replaced at an earlier age. After RLE, cataract surgery will never be needed. The artificial lens will not age which provides visual stability to the lens of the eye. There are several lenses to choose from to best customize to your specific eyes. One of the only downsides to RLE is missing out on the miraculous feeling of undoing 50 years of lens hardening and darkening in a 10 to 15-minute surgery. The only way to get that feeling, however, is to let the lens get that dysfunctional in the first place. Preventing that loss of function over the years is part of what makes RLE so miraculous, albeit in a more lifelong rather than spontaneous kind of way. It is the miracle of having a lens that doesn’t age, instead of a lens that seems to age quicker than the rest of you. Also, I don’t know about you, but in the last year I have lost two expensive pairs of glasses, not to mention the countless ‘readers’ I have all over the house and my office. When I think of all the costs associated with glasses and contacts, RLE may be a great value monetarily as well. After all, great vision is priceless at any age! https://www.voeyedr.com/wp-content/uploads/2018/03/visionary-eye-doctors-logo-lg.png 0 0 Kim Neal https://www.voeyedr.com/wp-content/uploads/2018/03/visionary-eye-doctors-logo-lg.png Kim Neal2018-05-24 15:34:272019-04-18 13:59:30Does RLE really prevent me from getting cataracts? People often take their vision for granted, especially if they don’t need to wear corrective lenses. Even those who are nearsighted, farsighted, or have astigmatism might become complacent about eye exams if their vision is stable. Eye exams can detect vision problems that you may be completely unaware of and allow for the earliest treatment possible, which may just save your sight! One of our wonderful optometrists, Dr. Lorena Riveros, recently had a couple of patients that reported prior to their vision exams, their eyes and vision felt okay. However, during their exam, Dr. Riveros discovered large retinal holes that could have resulted in retinal detachment. Unfortunately, retinal holes are asymptomatic and fortunately, thanks to their eye exam with Dr. Riveros, they were able to get treatment and potentially save their eye sight! Regular eye exams can provide early detection of eye issues and gives you the opportunity to consider a wider range of treatment options. Your eye doctor can also identify underlying health problems just by looking at your eye health. In some cases, conditions like high blood pressure, diabetes, cancer and other medical conditions can be identified during regular eye exams. If you have any family history of eye disease or vision problems, you should schedule eye exams more frequently. Think about it, when was the last time you had an eye exam? Don’t put it off another year. Schedule your eye exam with us today! Dry eye symptoms are the worst! Itching, watering, redness, sensitivity…It’s bad enough when these symptoms appear during allergy season. But when you have chronic symptoms that don’t go away, it might be time to seek professional relief. This is caused by blockage to the glands in the eyelid (the Meibomian glands) which leads to a shortage of oil on the surface of the tears and quicker than normal tear evaporation. This type of dry eye accounts for most of all dry eye cases. This occurs when the lacrimal glands do not produce enough tears. As a Dry Eye Center of Excellence, led by Dr. Sandra Lora Cremers, we use the most advanced technologies and techniques to diagnose and completely understand your dry eye and then treat it so you can get back to comfort and normalcy. Dr. Cremers is one of the top dry eye specialists in the United States. Patients from all over the world have sought her out for leading-edge treatments, including stem cell therapy and PRP injections to the Meibomian glands for those with severe, painful, treatment resistant dry eye. If and when it will be appropriate and effective, one of the more common treatment options for Evaporative Dry Eye is the LipiFlow® Thermal Pulsation System. LipiFlow has been shown to improve Evaporative Dry Eye symptoms in 79% of patients within just four weeks of treatments. LipiFlow unblocks the eyelid glands through the application of controlled heat to the inner eyelid. This heat allows the glands to stimulate the production of complex natural oils for your tear film. Can LipiFlow Provide Relief for You? The first step is to determine the root cause of your dry eye symptoms. One of the tools we use is the non-invasive LipiView® diagnostic test to assess your tear film and the Meibomian Glands Evlauator to examine the quantity and quality of the oils. Once armed with the facts about your eyes, we can discuss your treatment options. Now offering special pricing on LipiFlow, if you are interested please give us a call to discuss your treatment options. We are here to get you relief! For more info on dry eye, visit www.eyedrymd.com. Eyes on Spring – Need New Shades? Outdoor lovers, rejoice! The biggest names in polarized sunglasses—Costa, Maui Jim, and Oakley—are offered at higher price points, and though by most accounts they are worth the cost, our Dr. Babak Hosseini felt we needed a comparable, affordable alternative – INVU Ultra Polarized sunglasses from Swiss Eyewear Group, personally field tested and endorsed by Dr. Hosseini and many, many others who spend time in the great outdoors. The INVU sunglasses have not one, not two, but 9 layers of ultra- polarization to deliver the ultimate in glare-free vision. INVU Special Price, $99.95 Through May, 2018! * 20-unit minimum. Cannot be combined with any other offer. Offer valid through 06.30.18. Call 301-896-0890 for a complimentary BOTOX consultation today and mention the special pricing offer when you schedule! *Results may vary. Risks, benefits and alternatives will be discussed during your consultation. Full prescribing information and important safety information will be provided during your consultation. Thank you for the privilege of caring for your eyes!